Maher thoughts: Do you Gingerbread? 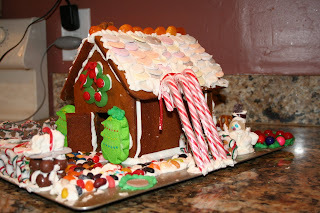 We were invited over to our friends house to decorate Gingerbread houses. It was a lot of fun. My friend Tori makes all the Gingerbread. We just had to show up with some candy to share with our group of friends. Then have fun decorating. Shaun couldn't come because he was working with his group on his group project. So I had some of our friends kids helping me. It was really a fun time! 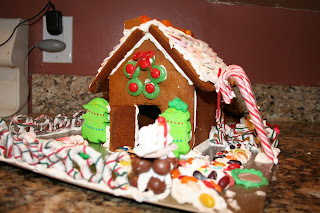 I haven't decorated a Gingerbread house in a long time. I'm excited to continue to do this every year. I didn't have time to finish the house the way I wanted to. I live on Max time, and it was time to take Max home and put him to bed. Otherwise, This house would have been plastered in candy. I love the aroma my house has because of the gingerbread. It makes me smile every time I see it. Thanks to my great neighbors and friends the Brunsons. I love my Gingerbread house!